This article was originally written by Rockrunner writer David Johnson for the Daily Herald and published in the July 3, 2009 edition of the newspaper. To view the original article please go here. When I think about it, Bigfoot is an outdoor superhero. OK, he isn’t exactly like Batman or Spider-Man — he doesn’t save damsels in distress or fight villains with bad taste in cosmetics. And he doesn’t cover his actions with secret identities or costumes. But he’s quite talented in covering his tracks. While that may not exactly be a super power, with feet like that, it’s quite an accomplishment. Whether Bigfoot exists or not is exactly my point here. The fact that we have to question his existence is wondrous. Out of all the documented sightings, none describes him hunched around a fire ring on a chilly morning. Unlike many humans out in the wilderness, Bigfoot doesn’t leave toilet paper flowers. Why do we as campers, hikers and outdoorsmen think other people want to see our living habits? From the Leave No Trace Center for Outdoor Ethics, here are some tips to help you be as elusive as Bigfoot. There are seven basic principles of Leave No Trace: 1) plan ahead and prepare, 2) travel and camp on durable surfaces, 3) dispose of waste properly, 4) leave what you find, 5) minimize campfire impacts, 6) respect wildlife, and 7) be considerate of other visitors. With a little practice you can enjoy the outdoors and assure that everyone else can have the same quality experience as you. When the squirrels are taking pictures of you and telling their friends, “No, I really did see a human,” then you know you are doing something right. Understand all rules and regulations that may be in effect for the area you are planning on attending. This also includes getting permits, respecting private land, archaeological ruins and leaving pets at home or putting them on a leash. Prepare for extreme weather, hazards and emergencies. This is even important in “front-country” areas. Visit in small groups. Split larger parties into groups of four to six people. Repackage your food. Take food out of boxes and put it in a plastic baggie. The baggies also can be used to remove waste. Become familiar with maps and compasses to eliminate the use of cairns and marking paint. Know before you go. Check information sources like maps, books and people. Durable surfaces include established trails and campsites, rock, gravel, dry grasses, sand or snow. Protect riparian areas by camping at least 200 feet from lakes, streams and other water sources. Good campsites are easy to find. You shouldn’t have to make one, altering the landscape. In popular areas, campsites are usually provided. Concentrate your use on existing trails and campsites. Walk single file on trails, even when wet or muddy. Do not walk around mudholes. It only makes the path wider. Disperse use to prevent the creation of campsites. Avoid places where early signs of impact are beginning to show. Avoid walking, sitting or climbing on archaeological ruins. Camp at least 200 yards from archaeological sites. Leave campsites clean and natural looking. If you pack it in, pack it out. Use outhouses or public restrooms when available. Deposit human waste in catholes. Dig a hole 6-8 inches deep at least 200 feet from camps, trails and water sources. Cover and disguise the cathole when finished. Carry dirty water 200 feet away from camp and scatter it. Use biodegradable soap in small amounts. Check regulations. In some areas, it is best to urinate in flowing water. Pack out all small and unused food particles. Do not build structures, furniture or dig trenches. Treat living plants with respect. Carving, hacking or peeling plants may kill them. Use lightweight stoves for cooking. When permitted, use a designated fire ring, fire pan, fire blanket or mound fire instead of building your own fire ring. Use dead or downed wood. Use wood small enough to be broken by hand and no larger than an adult’s wrist to keep fires small. Burn all wood and coals to ash. Then scatter the ashes. In river corridors pack the ash out with you. Keep fires at least 200 yards away from archaeological sites. Observe wildlife from a distance. Do not follow or approach animals. Just because the animal may look cuddly doesn’t mean it is. This is not just regarding respect; wild animals must be left alone for safety reasons. 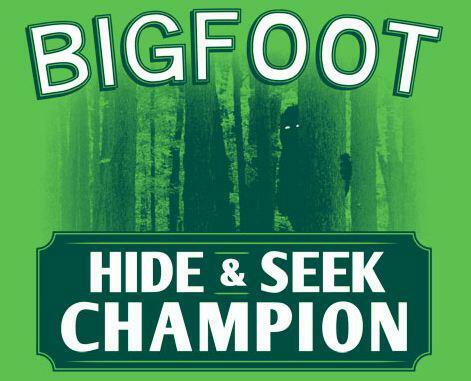 Bigfoot is the exception, if you see him I want pictures. Protect wildlife and your food by storing rations and making sure the trash is secured. Control pets at all times or leave them home. Avoid wildlife at sensitive times: mating, nesting, raising young, or during winter. During winter, food may be slim and you may not be. Respect other visitors and protect the quality of their experience. No loud music at midnight in public campgrounds. Be courteous. Yield to others on the trail, especially if they are the uphill traffic. Step to the downhill side of the trail when you encounter pack stock, e.g., horses, donkeys, goats, llamas — and Bigfoot. Camp away from the trails and other visitors. Let nature’s sounds prevail. Avoid loud voices and noises. Screaming in the event of a Bigfoot sighting is permissable, but you better have pictures to prove it. Keep your pets under control. When other people are passing on the trail put pets on a leash. Your pet may be well-behaved, but some people are afraid of dogs. Having them on a leash will make others feel more secure. Leave larger camps for larger groups. Avoid graffiti. Most people don’t go to the outdoors to read the latest poem. For more information on activity-specific tips for Leaving No Trace visit www.lnt.org or call 1-800-332-4100.